In February, Antioch Friends of Animal Services Founder and President, Barbara Sobalvarro, will be celebrating 40 years of lifesaving service to the pets and citizens of Antioch. 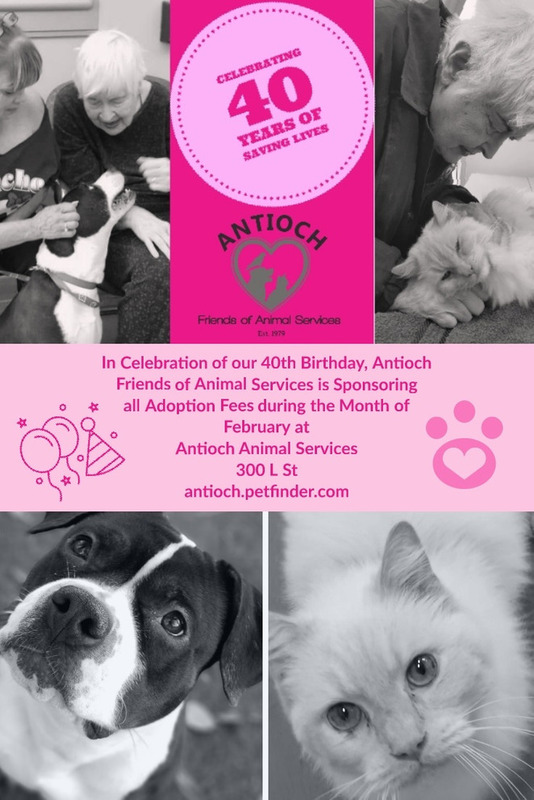 In honor of this 40th anniversary, and the upcoming Valentine’s Day holiday, Antioch Friends of Animal Services will be sponsoring the adoption fees for any animal adopted from Antioch Animal Services during the entire month of February. In addition, Sobalvarro was honored by the Antioch City Council during their meeting on Tuesday, Feb. 5th. See the complete proclamation, below. The sponsored fee represents a savings of $96 for dogs, $76 for cats, $15 for rabbits and $7 for hamsters/guinea pigs. All pets available for adoption can be viewed online at antioch.petfinder.com or www.petharbor.com. Please join us, and Antioch FOAS Founder and President, Barbara Sobalvarro, for a Valentine’s Day / 40th Anniversary celebration from 1 to 4 p.m. on Saturday, February 16, 2019, at the shelter, 300 L Street in Antioch. Refreshments will be served. To learn more about Antioch Friends of Animal Services and their mission, please visit antiochfriendsofanimalservices.org. NOW, THEREFORE, I, SEAN WRIGHT, Mayor of the City of Antioch, do hereby congratulate Barbara Sobalvarro and the Friends of Animal Services on the occasion of 40 years of outstanding service to the citizens and animals of Antioch. This entry was posted on Tuesday, February 5th, 2019 at 10:19 pm and is filed under News, Community, Pets & Animals. You can follow any responses to this entry through the RSS 2.0 feed. You can leave a response, or trackback from your own site.